Karl and I live a couple of blocks away from Joanie’s Cafe on California Ave in Palo Alto, but we’ve never tried eating there. After educating young minds at work all morning, Karl and I walked to Joanie’s for lunch. This was us trying to be adventurous and try something new. I rarely order salads when pancakes and french toast are on the menu, but I noticed two people having salads next to me. I had hearts in my eyes for those salads at first sight (mostly because it was the first thing I saw). My eyes did not deceive me. The salad was so delicious. 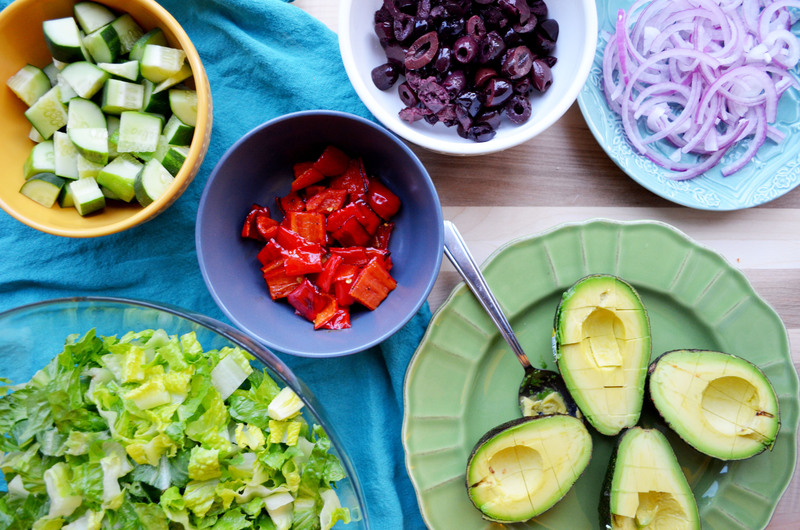 I loved everything about it – the salty olives, crispy lettuce, cool cucumber, spicy chicken, and buttery avocado! The salad did not need much dressing, but the little dressing I added made the salad irresistible. It was one of those dishes that I couldn’t stop eating, even though I was full. I recreated the salad and incorporated my own touches. It is just as good, dare I say…even better! It will leave you feeling full, satisfied, and thankful that you tried this recipe! I usually leave out the top end of romaine lettuce because it’s quite bitter. Palo Alto’s awesome farmer’s market is conveniently held on California Ave on Sundays. I love this farmer’s market. It is always happening! Great music, fun foods, and awesome produce. 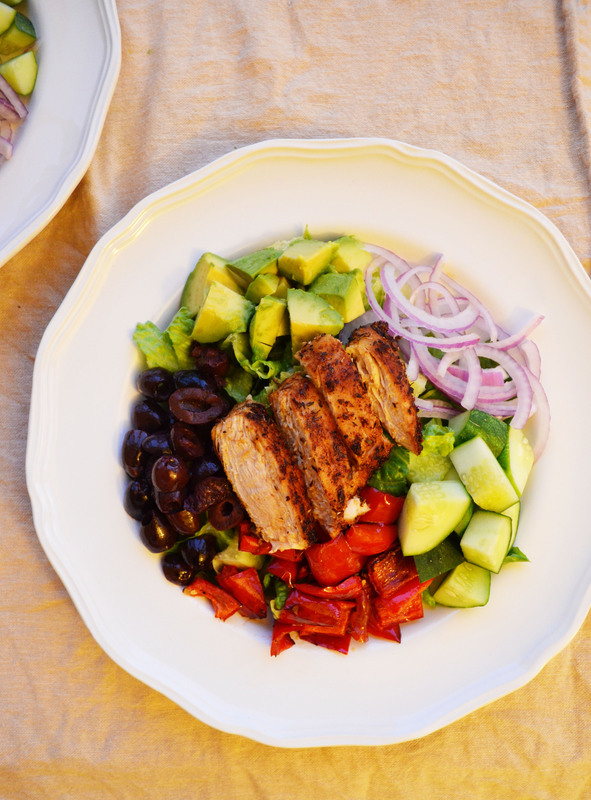 Being around fresh produce inspired me to recreate Joanie’s Cajun Chicken Salad. We bought as much as we could for the salad at the farmer’s market. 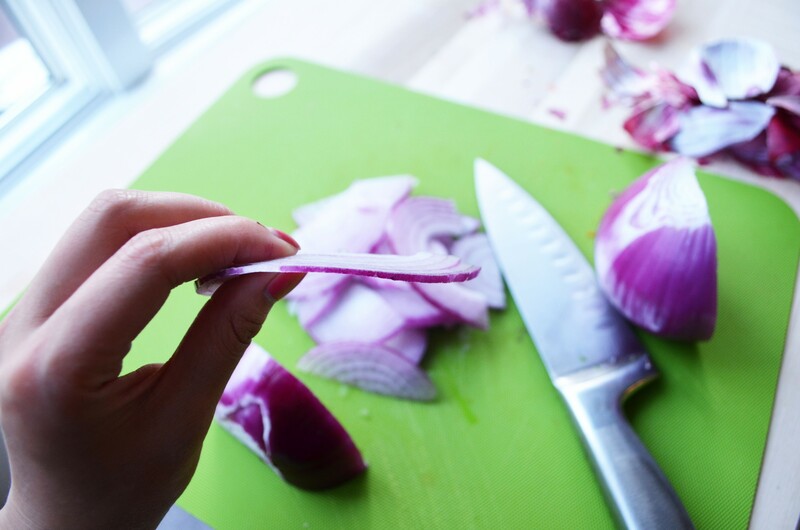 The key to slicing red onions thinly is simply going slow. 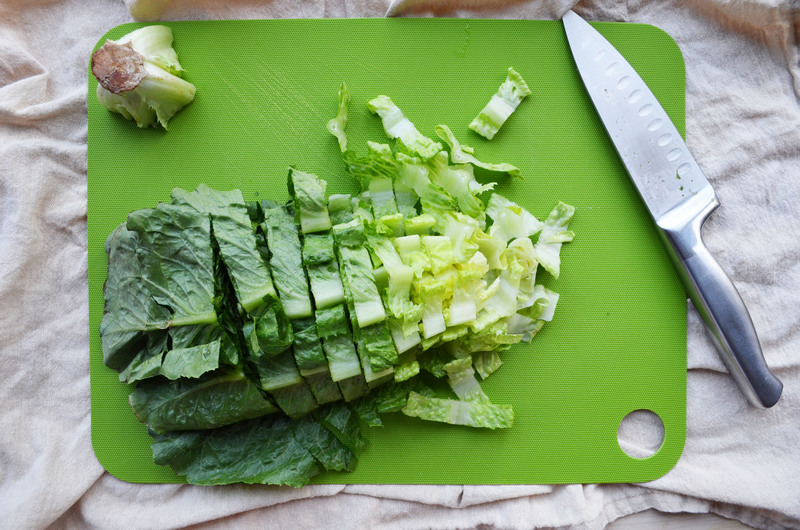 You want to use the knife to shave off thin pieces. The cajun dry rub for the chicken asks a lot of your spice drawer, but it’s so worth it. If you have extra time (and a grill), try grilling the chicken! Store the extra dressing in the fridge and save it for a rainy day. Top this beauty with slices of cajun chicken breast, pour in a little dressing, and enjoy. In a small bowl, mix together the paprika, salt, garlic powder, black pepper, onion powder, cayenne pepper, dried oregano, and dried thyme. Rinse and pat the chicken breasts dry. Coat the chicken breast in the dry rub. Over medium heat, heat oil in a saute pan. Cook the chicken breast for 7 minutes on each side. After allowing for time to cool, slice the chicken breast into thin strips. In a large bowl, whisk together the red wine vinegar, olive oil, garlic powder, dried oregano, dried basil, black pepper, salt, onion powder, and Dijon Mustard. Set aside. Preheat the oven to 400 degrees. In a large bowl, mix together the red bell peppers, salt, pepper, and olive oil. Roast the bell peppers in the oven for 15 minutes. Set aside. 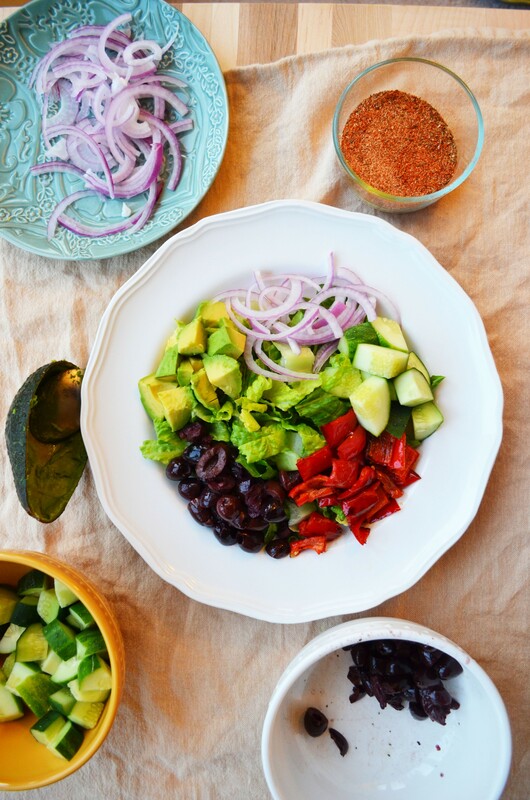 Plate the romaine lettuce, avocados, cucumbers, olives, onions, and red bell peppers. Top with sliced chicken breast. This entry was posted in Entrees and tagged sauce & dressing.